AI is changing the world and and sales is no exception. Today I’m excited to share with you a BIG development in the world of sales research made to improve your close rate. 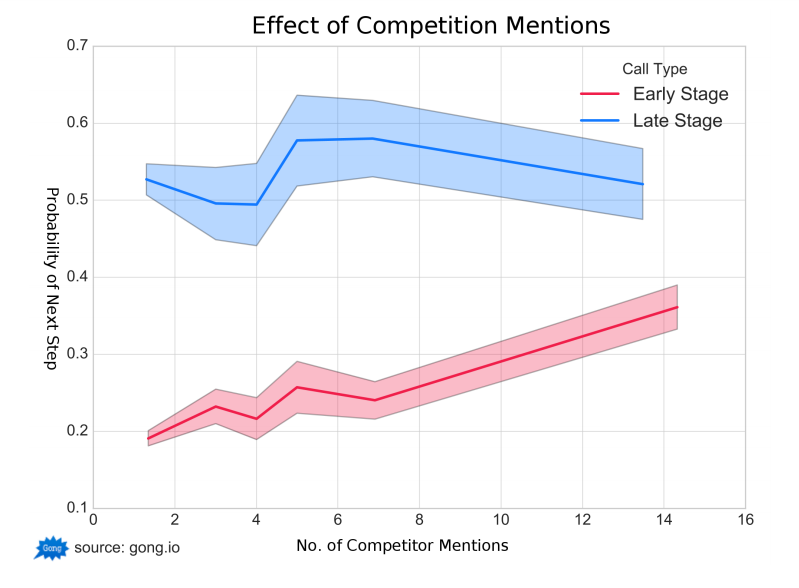 I’ve been lucky to team up with the data science team at Gong.io on a new comprehensive study that goes into an analysis of over 70,000+ B2B SaaS sales calls. You heard that right. To my knowledge this is the largest sales study of its kind to date. Should you be concerned if competitors are brought up early in a sales conversation? Should you let a customer go on a talking streak before you demo? How long is too long? How is your close rate impacted by talking about your company for more than 2 minutes? While you might take a guess about the above answers, we now have an analysis to support our assertion. Takeaway #1 — Competitor mentions before you demo are a GOOD sign. According to the sales call data analyzed, there’s actually a 49% increase in probability your opportunity will advance if competition is mentioned at least 1X in the early stages of a process. Competitor mentions LATER in your sales process have the reverse affect. This seems obvious in hindsight when I compare my own anecdotal knowledge of companies averaging 25%+ average close rates to the companies I know averaging 10% close rates when look at their onboarding programs. Companies with higher close rates invest in competitor education for new reps. On the flipside, the companies who breeze through competitor education I see averaging lower close rates. The takeaway? Educate yourself on your competitive position in the market and be ready to discuss it with prospective buyers. It could mean up to a 50% difference in your probability of advancing deals. 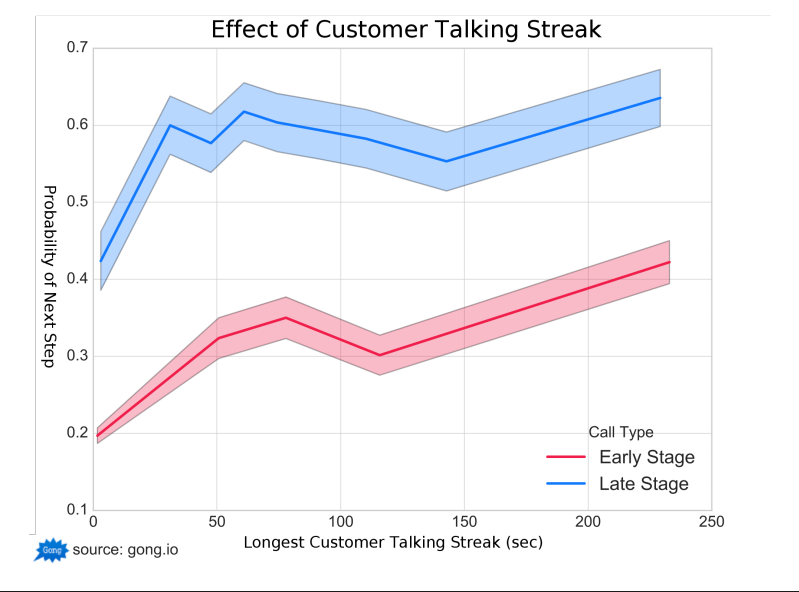 Takeaway #2 — Let your customer go on a “talking streak” for at least 4 minutes. If you’re able to get your potential customer to talk for at least 4 minutes probability of advancing your deal increases. If you only manage to get your customer to talk in a straight line for only 50 seconds, chances of closing the deal are lower than average. I know the experienced sellers reading this are like, “duh Juliana…” But hear me out. Now you have data to back you up. One common challenge I see when I meet with newer sales people or founders is that they often tell me they feel uncomfortable asking more of these clarification questions once a buyer has already told them their problem. It’s as if they feel like they’re being “too nosey” or they are “too young” or “too inexperienced” to ask executives these questions. If that sounds like you, that’s a limiting belief you need to eliminate from your psyche today. After all, you talk daily with more of this executive’s peers than they do and that makes you an expert in your own right. Next call, I challenge you to drill in a little deeper and see how much you can get them to open up. If you’re not sure where to start, this presentation on pain finding questions can get you on your way to asking smarter questions in your sales conversations. Caveat: Short clarifying questions like “can you elaborate?” or “can you give me an example?”, or “tell me more…” won’t break your customer streak, but will help extend it. Takeaway #3 — Don’t talk about your company for more than 2 minutes. When I saw this below graph, I was like…hallelujah. The case for a 2-minute pitch cliff. 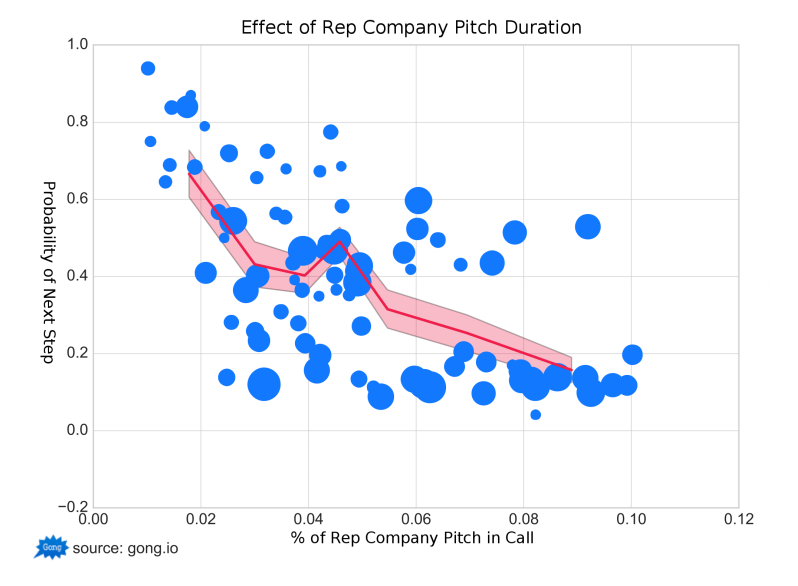 What Gong.io found from these 72,326 calls is that if you pitch your company more than 2 minutes, you’re basically walking your close rate off a cliff. Based on how fast the modern buyer journey is changing, I’d predict this 2 minute cliff number will decrease over the next year — especially in technology sales. The data suggests that if you spend 10% of a call discussing your company, your odds of closing the deal will be 1/4 of your peers. That means, if the top sales rep on your team has a 24% close-rate, and you’re a talker, your close-rate is likely to be a mere 6%. So yes, you can literally talk your close rate off a cliff. The takeaway? Get your company pitch down to 2 minutes max. Anything more and you’ll hurt your close rate. Bio: Juliana Crispo is the Founder of Startup Sales Bootcamp, a tech enabled sales school with 2,000+ students from 128 companies like Google, Salesforce and LinkedIn. She’s one of the top 50 influencers to know in Technology Sales and BD by Tradecraft and her work has been featured in Forbes, Fortune, Huffington Post and more.